Dr. Dennis Gross FacebookDr. Dennis Gross' Alpha Beta line, including and inspired by the famous Peel Pads. The Dr. Dennis Gross Alpha Beta Pore Perfecting Cleansing Gel ($38) is by far the best facial cleanser I've tried after cycling through expensive and drugstore buys alike for the last decade. After six months of daily use, my skin's tone and texture are more even, my complexion is clearer, and my skin is better hydrated. Fine lines and dark spots also seem less noticeable. The gel cleanser is fragrance- and soap-free, vegan, and plant-based. Don't miss: 17 cheap and effective skin-care products under $25 we swear by in our everyday lives and the definitive Insider Picks buying guide to the best face cream for sensitive skin. In my search for great skin-care products, I have struck gold a few times. 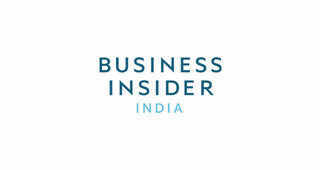 With enough persistence and a job that sends thousands of products across your desk every year, you get lucky. I've found invisible acne patches that clear up my blemishes overnight, a clay mask that prevents breakouts before they happen, a dark-spot corrector that fades dark spots in a few weeks, a silicone tool that removes up to 99.5% of dirt and oil, and an essence that gives me glowing skin, to name a few products. But, in all that time, I never landed on a facial cleanser that I was truly excited about. It was always the weak link in an otherwise-airtight routine. Fan-favorites like CeraVe were gentle and effective, but underwhelming - my skin still frequently felt slightly dry and tight after using them. Expensive face washes felt good to use but didn't seem to radically improve the quality of my skin. That is, until I found myself sitting next to a woman with fewer pores than a marble statue six months ago at a press dinner for a women's clothing brand. 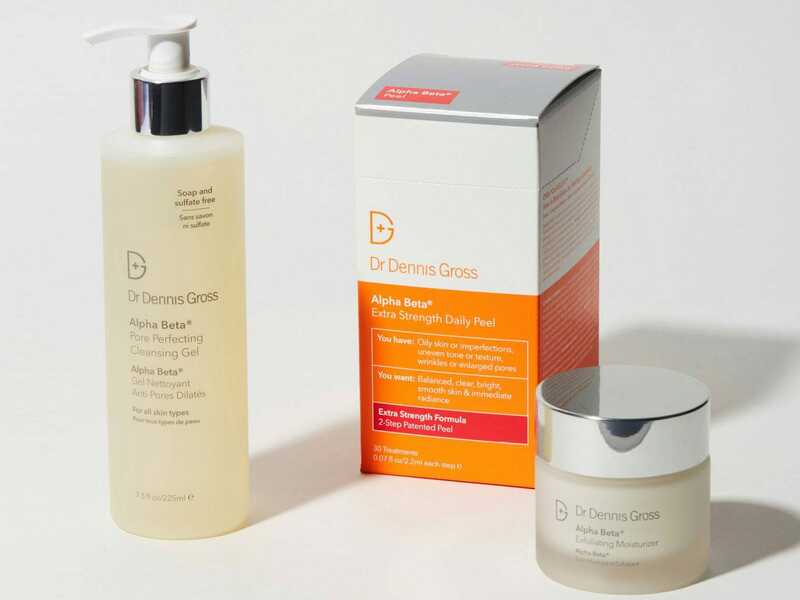 By the main course, she had given me the pièce de résistance of her routine: Dr. Dennis Gross' Alpha Beta Pore Perfecting Cleansing Gel ($38) and Alpha Beta Exfoliating Moisturizer ($68). The Alpha Beta product line expands upon Dr. Gross' famous Alpha Beta Peel (30 Packettes, $84), which uses alpha and beta hydroxy acids to exfoliate and stabilize the skin all the way down to the lining of your pores. The products work to even tone, prevent acne, and minimize the appearance of pores and fine lines. The cleanser and exfoliating moisturizer do the same. The Alpha Beta Cleansing Gel is silky, non-irritating, and leaves my skin feeling and looking tighter without being harsh and drying. In tandem with the rest of the products in my skin-care routine, it has gently exfoliated my skin to a point where stubborn dark spots are no longer noticeable enough to necessitate being covered with makeup. Dr. Dennis GrossDr. Dennis Gross' Alpha Beta Cleansing Gel is the best cleanser I've ever used. The cleanser's formula took Dr. Dennis Gross, the dermatologist who heads up the eponymous line, four years to perfect. It uses alpha and beta hydroxy acids to encourage the skin's natural shedding, stabilize pores, and support new cell turnover, plus state-of-the-art cleansing ingredients. Willow bark extract helps shed dead cells and clear pores and protects against environmental stressors. Farnesol inhibits the growth of certain bacteria in the skin and helps prevent breakouts. Barosma betulina leaf extract reduces fine lines and pores by balancing sebaceous secretion and limiting lipid production. Tremella fuciformus (aka mushroom) extract hydrates and protects the skin against free radicals by enhancing the body's own superoxide dismutase (an antioxidant defense against stress that can cause damage to skin cells). Pretty much anyone. The Alpha Beta Cleanser works for normal, oily, combination, dry, and/or sensitive skin. I have sensitive combination skin and don't experience dryness or oiliness after using it. It's formulated without soap or fragrance. You won't find any parabens, sulfates, or phthalates listed among its ingredients either, since they are known skin irritants. The Alpha Beta Cleanser feels like a gel to the touch and develops a rich, cushiony lather once you introduce it to lukewarm water. Massage it with water into the clean skin on your face, neck, and wherever else you want, and wash clean after a minute or so. It can also be used to treat keratosis pilaris (dry, rough patches of skin with tiny bumps). For optimal results, Dr. Gross recommend you use it both morning and night every day. After using it, my skin looks visibly tighter (fine lines appear less distinct, pores shrunken), bouncier, and brighter. It feels soft to the touch and it looks "glowy." Over the last six months of use, I've noticed more hydrated, clear, and even skin. My dark spots have faded visibly with the constant exfoliation, and the cleanser - plus a stable of other skin-care products - helped me finally ditch foundation. As one Sephora reviewer put it, the cleanser is "gentle enough to use every day but has drastic results." This is simply the best cleanser that I have tried yet. It's the only one I've liked enough to reorder, and loved enough to genuinely look forward to washing my face. It has noticeably improved the clarity, texture, and tone of my skin in both the short and long term. I wish I wasn't spending $38 on face wash, but I still have about 3/10 of the bottle left after six months of daily use. I've tried more expensive cleansers that haven't worked nearly as well, and the industry is synonymous with unnecessary markups. I'd truthfully pay more than $38 per bottle, but I'm glad I don't have to. Plus, it's no small thing that this is soap-, fragrance-, and cruelty-free. It's vegan, plant-based, pH-balanced, and works with the skin's natural processes rather than trying to fight and rewire them. I'll keep buying this cleanser until I find something better or Dr. Dennis Gross stops making it. If you're looking for a new cleanser, I highly recommend giving it a try. 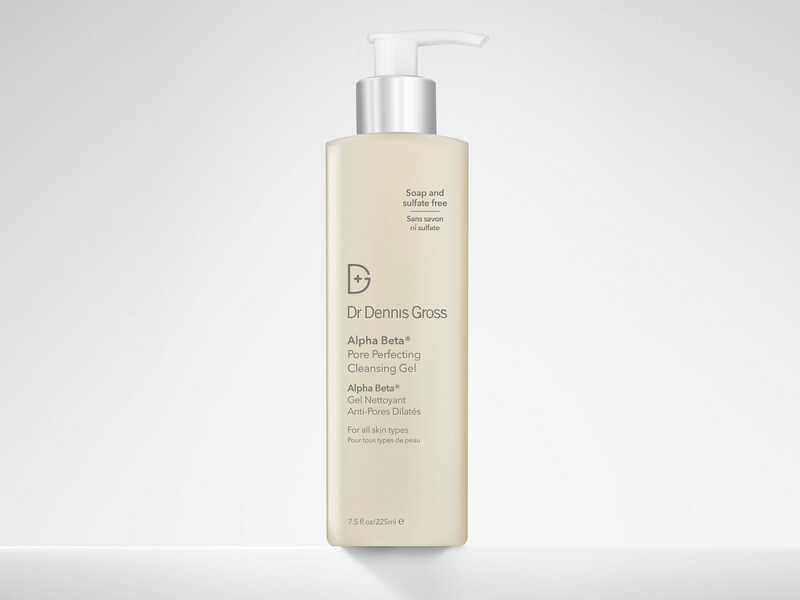 Buy the Dr. Dennis Gross Alpha Beta Pore Perfecting Cleansing Gel at Sephora and Dermstore for $38.